Elabuga – a pearl of the Volga region. Created in the building of merchant’s shop. 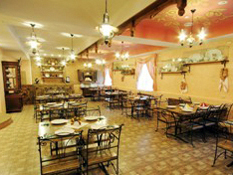 Theatrical atmosphere of a XIX century tavern is represented here; feature of the Museum-Theater “Tavern” is that it allows visitors to taste the dishes of Russian cuisine that were served in the XIX century. Waiter, bartender, tavern owner dressed in stylized costumes of the XIX century serve visitors of the Museum-theater “Tavern”.